There are 173 Assisted Living Facilities in the Smyrna area, with 5 in Smyrna and 168 nearby. The average cost of assisted living in Smyrna is $3,158 per month. This is lower than the national median of $3,346. Cheaper nearby regions include Marietta with an average starting cost of $2,932. To help you with your search, browse the 961 reviews below for assisted living facilities in Smyrna. On average, consumers rate assisted living in Smyrna 4.6 out of 5 stars. Better rated regions include Duluth with an average rating of 4.7 out of 5 stars. Caring.com has helped thousands of families find high-quality senior care. To speak with one of our Family Advisors about assisted living options and costs in Smyrna, call (855) 863-8283. Located in Cobb County, Smyrna, Ga. is on Money Magazine's 2018 edition of Best Places to Live in America, which ranks cities based on economic growth, affordability, and quality of life. Seniors in Smyrna who need some help with activities of daily can choose from four assisted living facilities in Smyrna and another 54 facilities nearby. The Healthcare Facility Regulation, a branch of the Georgia Department of Community Health, licenses and regulates assisted living facilities in the state. Smyrna has a reputation as a safe community in Georgia. Its crime rate is less than both the national and state averages. The national average of crimes (per 100,000 people) is 2,837; in Smyrna, the average is 1,745. In terms of public transportation, Smyrna is served by the Cobb Community Transit, which offers paratransit services for eligible riders, and MARTA public buses, both of which offer reduced fares for seniors. Smyrna features services and centers especially with seniors in mind. The Smyrna Senior Citizens Center features programs and events such as organized trips designed for seniors aged 55 and older. The city of Smyrna is home to world-class medical facilities, including WellStar Medical Group Primary Care Center, in the event of medical emergencies or illness. Smyrna experiences, on average, 220 days of sunshine. However, summer temperatures can be hot and humid with an average temperature of 88 degrees. The city’s mild winters produce an average January temperature of 31 degrees. The cost of living index in Smyrna is slightly above the Georgia cost of living average by about 14 points. However, Smyrna’s cost of living is only seven points above the national average. Assisted Living costs in Smyrna start around $3,158 per month on average, while the nationwide average cost of assisted living is $4,000 per month, according to the latest figures from Genworth’s Cost of Care Survey. It’s important to note that assisted living rates in Smyrna and the surrounding suburbs can vary widely based on factors such as location, the level of care needed, apartment size and the types of amenities offered at each community. As in other areas of the state, Smyrna’s eligible seniors may receive financial assistance to help pay for assisted living from Medicaid. Medicaid offers two types of waivers, including Community Care Services Program (CCSP) and Service Options Using Resources in a Community Environment (SOURCE). 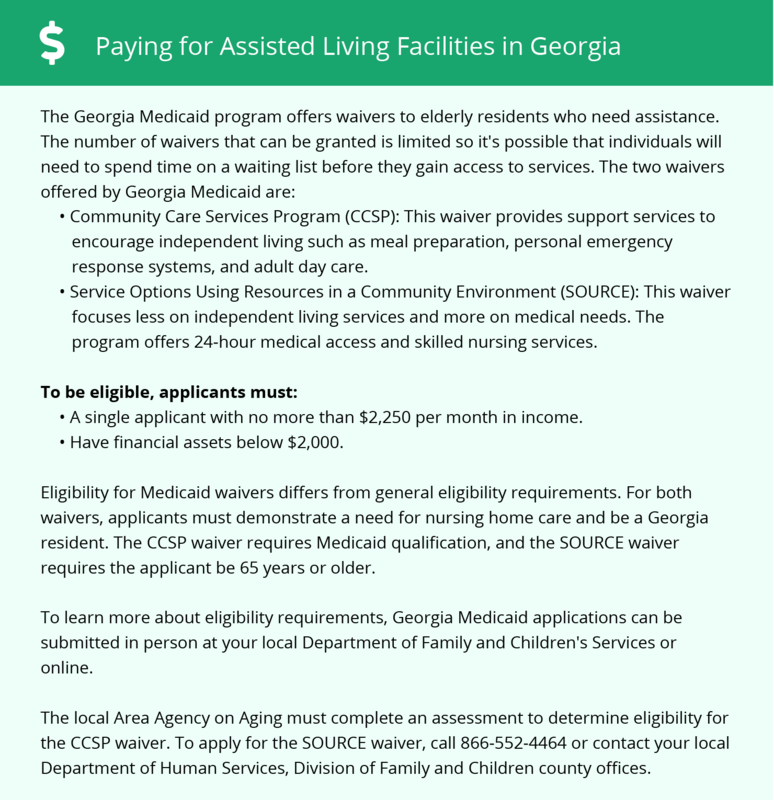 Georgia also offers the Independent Care Waiver Program that may provide assistance for eligible seniors who need the type of care available at assisted living facilities. Smyrna and the surrounding area are home to numerous government agencies and non-profit organizations offering help for seniors searching for or currently residing in an assisted living community. These organizations can also provide assistance in a number of other eldercare services such as geriatric care management, elder law advice, estate planning, finding home care and health and wellness programs. To see a list of free assisted living resources in Smyrna, please visit our Assisted Living in Georgia page. Smyrna-area assisted living communities must adhere to the comprehensive set of state laws and regulations that all assisted living communities in Georgia are required to follow. Visit our Assisted Living in Georgia page for more information about these laws.